Most people would say that they need a little bit more disposable income. Everyone has something that they’d like to do if they had some extra cash – take a holiday, re-decorate, finally pay off that credit card. However, there is one group of people who probably need that extra money more than anyone else – new parents. Kids are expensive, and babies are the most expensive of all. Cots, prams, car seats, baby carriers, baby monitors, breast pumps, changing tables, toys. Then there are the clothes that fit one week but are too small the next. And let’s not even get started on the nappies! Every week there is more and more money going out. Wouldn’t it be nice if there was some money coming in as well? 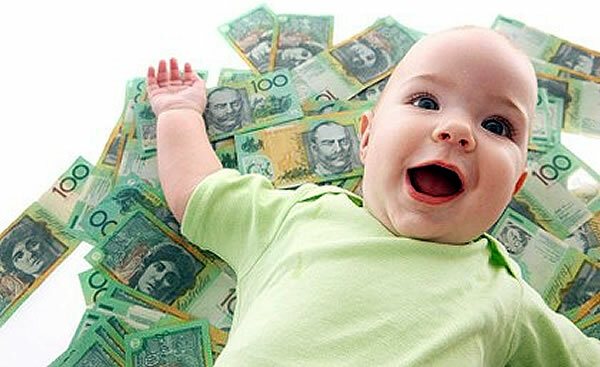 These extra expenses aren’t exclusive to Australia, babies are expensive all around the world. However, in the U.K., mums (and dads) have found a way to help ease the burden. It’s called Matched Betting and it is a risk-free way to make money online. Matched Betting is not gambling. It doesn’t require any sports knowledge or luck. Instead, Matched Bettors make money by using maths to guarantee a profit from bookmaker sign-up bonuses and promotions. By betting on all possible outcomes there is no way you can lose. Matched Betting has even helped some mums so much that they want to tell the world about it. Just type ‘Matched Betting Mum’ into Google and you will find several blogs written by stay-at-home-mums who have supplemented their incomes this way. You might be thinking “That’s great for those mums overseas, but how does it help me in Australia?“. Well, the good news is that matched betting in Australia is even more profitable than in the U.K.. Aussies love a punt, so the bookmaker market is very competitive. They are constantly offering bonuses and promotions to try to win new customers or hang on to their old ones. As Matched Bettors we can turn these bonuses into hard cash. The only problem with Matched Betting in Australia – until now – has been a lack of tools and information. All of the online guides have been focused on the U.K.. Australia has different bookmakers and different types of bonus bets, so these guides only have limited use. That’s why we have created bonusbank, the only Matched Betting website with tutorials and software dedicated to the Australian market. Bonusbank makes it easy for anyone to make a tax-free income while working from home. Our Matched Betting tutorials start at the very beginning and walk you through each step of the process. 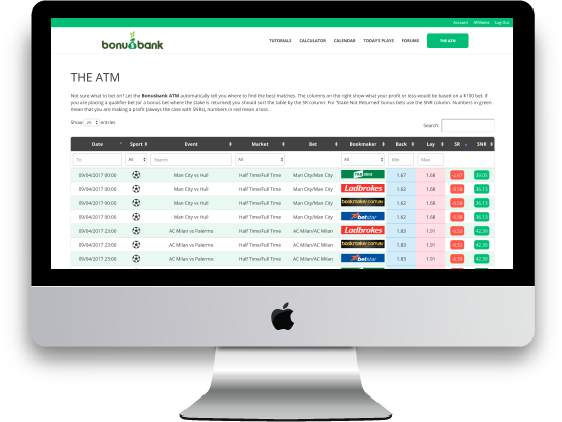 The bonusbank ATM – the only Matched Betting software of it’s kind in Australia – shows you what to bet on. Then our calculator tells you exactly how much you should bet. It’s that easy! There are over $5000 worth of sign-up bonuses available from Australian bookies. We show you how you can turn that into cash in your bank account. Then, after you have completed the sign-ups, you can start to follow ‘Today’s Plays‘. These are matched betting opportunities that we find every day and that take our members 5 minutes to follow. So far ‘Today’s Plays‘ have averaged an extra $100 per week in profits for our members. If you want to learn more you can sign up for a Free bonusbank account. The Free account gives you access to some introductory tutorials and some of our tools. It even shows you how to complete a sign-up bonus that could earn you up to $100. There is absolutely no obligation with the Free account. We don’t ask for any payment details and you can walk away at anytime if you decide it’s not for you. There’s nothing to lose. If you’re still not convinced you can check out our FAQs section or post your questions in the comments below. We’ll be happy to answer and help you on your way to a tax-free, and risk-free, income!